Head coach Bruce Arians reacts to a call during the fourth quarter of the Cardinals' 24-21 loss to the Eagles. TEMPE, Ariz. — It might be the gift-giving season, but Cardinals fans are well aware that they haven’t been on the receiving end of much good fortune the past two weeks. 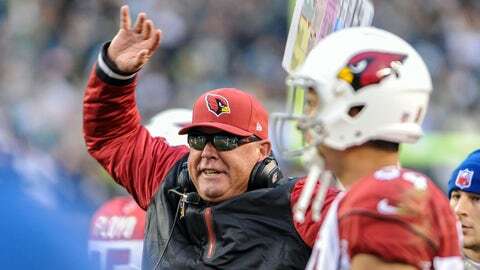 The Cardinals’ 3-4 start and a torrid NFC wild-card race has left them in the difficult position of chasing remote playoff hopes. But while a couple recent heartbreaks are fresh in fans minds, it’s also fair to point out that there were some key breaks that went the Cardinals’ way this season — breaks without which this playoff conversation might never have materialized. Here’s a look at four that went their way, four that didn’t and four killer games between other teams that hurt the Cardinals’ postseason chances. 1. Philly officiating: The Cardinals were on the wrong end of three pivotal late calls in a 24-21 loss to the Eagles. They were flagged for defensive holding twice (Tyrann Mathieu and Matt Shaughnessy) in the fourth quarter, wiping out a Patrick Peterson interception and giving the Eagles a vital first down with less than two minutes to go in the game. Those two calls were sandwiched around a fourth-down incompletion by Carson Palmer, whose throw to Michael Floyd fell incomplete thanks to some coverage by Bradley Fletcher that had the Cardinals looking for a flag (Floyd also thought he was interfered with on an earlier pass). 2. One game, four starters missing: New Orleans’ early seson 31-7 win looked one-sided, but it was a 14-7 game late in the third quarter. How much difference would those players have made? Nose tackle Dan Williams missed the game after the death of his father, linebacker Lorenzo Alexander (right foot) and safety Rashad Johnson (severed fingertip) went out in the first half, and outside linebacker Sam Acho (left ankle) went down in the third quarter. 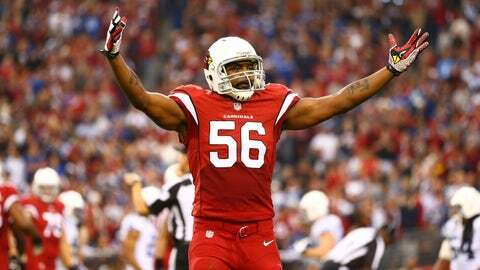 Alexander and Acho were lost for the season (as was reserve linebacker Alex Okafor). The loss didn’t seem as important when New Orleans was running away with the NFC South. Now the Saints are competing with the Cardinals for the line remaining NFC playoff spot. 3. Fitz’s fumble: We’ve shied away from players making mistakes or making plays because those aren’t really breaks as much as they are players creating the breaks. But who expects Larry Fitzgerald to fumble, let alone with his team trailing 22-20 and driving deep in San Francisco territory? With about a minute left in the third quarter, Fitzgerald caught a pass along the left sideline at the 49ers’ 23, but linebacker Patrick Willis stripped him, and safety Eric Reid recovered. San Francisco scored a touchdown off the turnover and went on to win 32-20 in another pivotal game that turned out to have major playoff implications. 4. The baddest break of all: It came before the season ever started when the Cardinals lost first-round pick and starting left guard Jonathan Cooper to a broken leg in the third quarter of the third preseason game against San Diego while making a block downfield. The Cardinals hadnât drafted a lineman in the first round since taking Levi Brown in 2007, and Cooper gave early indications that he was going to be special and give the team a long-sought run blocker. The offense was only scheduled to play one series of the second half. Cooper was lost four plays before that drive ended. San Francisco 34, Atlanta 24: Trailing 27-24, the Falcons were driving for a potential winning TD on Monday night when QB Matt Ryan’s pass was tipped by cornerback Tramaine Brock, then intercepted by linebacker NaVorro Bowman and returned 89 yards for a touchdown with just over a minute to play. Had Atlanta won that game, the Cardinals could have earned a playoff berth with a victory over the 49ers this weekend in Glendale. Carolina 17, New Orleans 13: Panthers quarterback Cam Newton hadn’t done much all day. But with his team in danger of falling into a wild-card tie with the Cardinals (a tiebreaker they would lose because Arizona beat them earlier this season), Newton led the Panthers on a five-play, 65-yard drive, capped by Domenik Hixon’s 14-yard TD catch with 23 seconds remaining to clinch a playoff spot and deliver a gut punch to the Cardinals’ hopes. San Francisco 19, Seattle 17: Seattle had held the 49ers offense in check all day, but after a Steven Hauschka field goal gave the Seahawks a 17-16 lead midway through the fourth quarter, QB Colin Kaepernick engineered an 11-play, 75-yard drive, capped by Phil Dawson’s 22-yard field goal with 26 seconds left to keep the 49ers in the wild-card driver’s seat. Carolina 24, New England 20: With Tom Brady and the Patriots driving late in the game, Carolina’s Luke Kuechly was whistled for pass interference in the back of the end zone because he had both hands wrapped around tight end on Rob Gronkowski on a pass which Carolina’s Robert Lester intercepted. But the officials quickly huddled and waved off the penalty, ruling Gronkowski could not have caught the ball, which was underthrown. Carolina escaped with its sixth straight victory in what eventually grew to an eight-game winning streak.